There are many alpine lakes in the Donner Summit area, the largest and most accessible of which are Donner Lake, Van Norden Lake and Serene Lakes (originally Ice Lakes). Donner Lake is of course the largest lake in the area and offers a wide range of water activities. It is the only lake in the area that permits gasoline engines and boating, water skiing, tubing and personal water crafts on the lake are very popular. The prevailing winds on Donner Lake also make it a great lake for sailing. There is a public boat ramp on the northwest end of the lake for launching larger craft. The lake is also popular with non-motorized craft like canoes and kayaks. There is a public swimming beach on the West end and a lagoon at the east end. The lake is a very busy place on a warm summer weekend. Serene Lakes or Ice Lakes is located at the top of the summit and is part of the headwaters of the American river. The lakes were the home of an ice harvesting industry for a while in the 1800s. Today the lake is surrounded by the cabins of the Serene Lakes community. There are two lakes, Lake Serena and Lake Dulzura, joined by a narrow channel. Lake Serena, the northern lake, is the water supply for the Serene Lakes community and swimming is prohibited. Lake Dulzura is open to swimming. Both lakes are closed to gasoline motorized water craft. There are a number of good sized lakes in the area north of Royal Gorge like Palisades, Kidd, Cascade and Long lakes. Most of these lakes are on private property and not accessible to the public, with the exception of Long Lake. Long Lake is out an the end of Kidd Lake Rd and is a popular swimming lake. Please refer to the Long Lake trail description for more info. There are many smaller melt lakes all over the summit area that serve as backpacking destinations and some of which offer high altitude lake fishing. Fishing in the Donner area is a mixed bag. The cold winters at the summit mean that most of the shallow alpine lakes freeze entirely killing most of the fish. As a result, the lakes need to be stocked every year with fresh fingerlings. 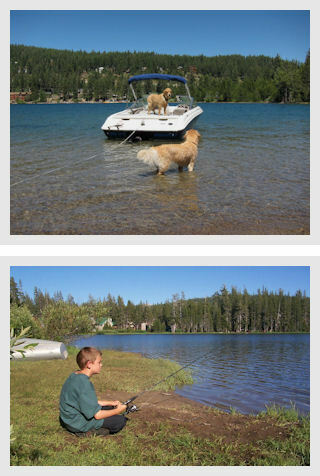 The larger and deeper lakes at lower elevations like Donner Lake and Boca/Stampede reservoir have well established fisheries and are very popular anglers spots. Serene Lakes is stocked and it has a catch and release policy. The area surrounding Castle Peak has several high lakes like Lake Warren that are stocked. There are some prime fishing areas near the summit area such at Lake Spaulding , the Truckee River (great for fly fishing) and the Boca/Stampede reservoir.